Two new additions to the property market combine the best of English architectural styles. Its English Heritage listed-building report of July 1952 describes Grade II*-listed The Priory at Odiham, Hampshire, as ‘15th century, 16th century, 18th century, late 19th century: a house of many parts and periods’—which gives some indication of the building’s architectural and historical importance. But this loveliest of Hampshire village houses—currently for sale through Knight Frank (020–7861 1080) and Savills (020–7409 8823) at a guide price of £4.5 million—is much more than an impressive melange of English architectural styles. Thanks to the flair and enthusiasm of owners Peter and Jane Goddard, the fading beauty that they bought in the early 1990s is now a charming family home of real distinction, surrounded by almost five acres of gardens and grounds. The village of Odiham was a place of importance in ancient times and, in 1086, was a Royal manor, boasting a large and prosperous community of tenants. A palace is thought to have been built there in the 15th and 16th centuries, but was probably destroyed during the Civil War, when some 5,000 troops were quartered in the town. Few traces of the former Royal mansion remain above ground, apart from the stone-built medieval wing of The Priory—built in 1445 as a Great Hall for clergy from Salisbury Cathedral— which then became a rectory with an adjoining vicarage. The Priory’s Great Hall of has an impressive vaulted ceiling. 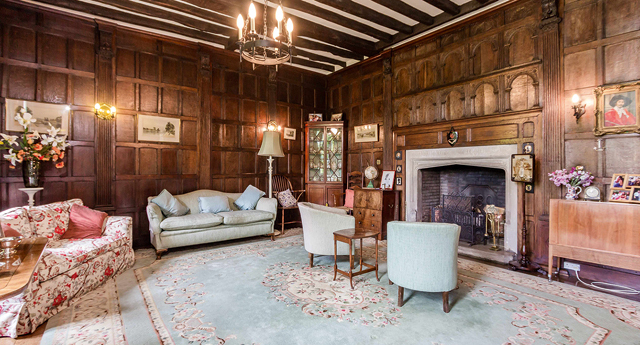 This two-storey medieval wing, with its arched, leaded windows, Elizabethan fireplace and flagstone flooring, was incorporated into the present main house by Lord Basing in the mid 1800s and its southern part converted to form a study and bedrooms. Planning consent has been granted to remove the wall between this room and the adjoining kitchen to create one huge kitchen/breakfast room. The northern part, meanwhile, was retained as a picturesque ruin— a powerful reminder of the building’s history and a and a dramatic backdrop to The Priory’s romantic gardens. The main house, built in 1702 of brick and stone around a Tudor core, is classically Queen Anne in style, with well- proportioned, high-ceilinged rooms. 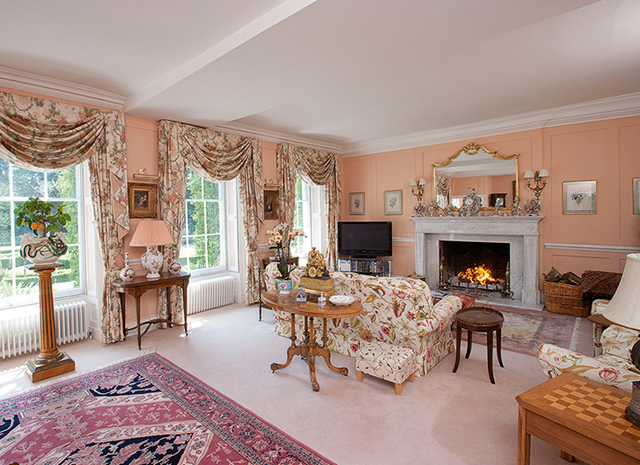 The drawing room is particularly fine, with wood panelling and an ornate marble fireplace, with access through an alcove to French doors leading to the south parterre garden. It links with the dining room, which mirrors the drawing room, with a marble fireplace on the east wall. The family room falls within the Victorian part of the house and can be reached either from the dining room or via the hall, which runs the length of the house. 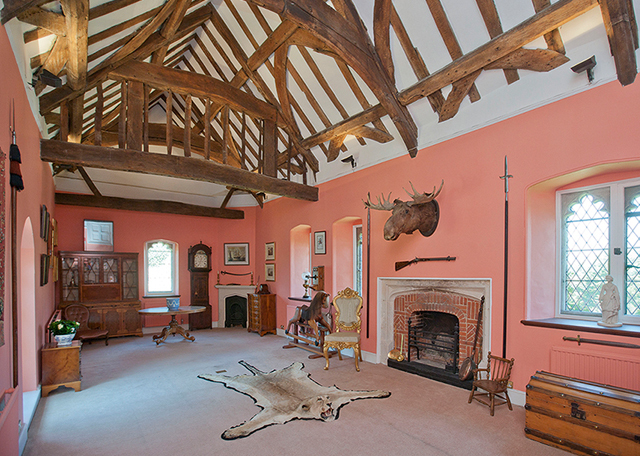 A wide staircase leads up to the Great Hall, with its impressive vaulted ceiling and ancient beams, and the master suite, with its panelled main bedroom, bathroom and dressing room incorporating the first floor of the 15th-century porch. Also on this floor are a large guest suite, two further bedrooms and a family bathroom. The second floor, currently used as a self-contained unit by the Goddards’ eldest son, has two further bedrooms, a bathroom and a kitchen, with access via the back staircase and its own ground-floor entrance. The Priory’s drawing room is particularly fine. On paper, the layout may sound like a bit of a magical mystery tour, but the house works wonderfully well as a family home, assures Mr Goddard, who masterminded every step of the long and delicate renovation process, which, in the case of a Grade II*-listed house, is rarely simple. But he makes light of any problems involved, merely claiming to have redecorated the whole house, upgraded and updated where necessary, sourced new fireplaces to replace the missing originals, installed modern bathrooms and central heating and, of course, created the gardens. The Priory is discreetly positioned off Odiham’s picturesque village high street, unseen behind banks of mature trees and a red-brick wall. The entrance from the road is understated, but, once inside the grounds, automatic gates hint at the grandeur that awaits. For more than 20 years, The Priory’s 4.7 acres of immaculate formal gardens have been a labour of love for its enthusiastic owners.  The first innovations were the creation of a sweeping new drive and a large pond with a central weeping willow, now the province of free-roaming ducks and geese. Around the house, a courtyard knot garden with intricate box hedging and topiary contrasts with the 15th-century ruins behind. The Goddards moved to The Priory when their eldest son was one month old. Now, with both of their sons about to fly the nest, they plan to downsize to a smaller house between Odiham and Alton, a favoured Hampshire location, less than an hour from London by car or train. They will be sad to move, but the legacy they leave behind will add another fascinating chapter to the story of this remarkable house. Across the county border in Surrey, Grade II-listed Tower Hill Manor at Gomshall, near Shere, is another house of many parts and periods, with a 16th-century core, re-fronted to the right in the late 17th century and to the left in the mid 18th century. The whole property was restored in the 20th century. Always a high-status house, the manor was an abbey until 1539, when it was returned to Henry VIII, who granted it to Sir Edmund Walsingham. ‘A spectacular opportunity to revive a Queen Anne gem’: Tower Hill Manor at Gomshall, Surrey, has been in the same family for 50 years and has a ‘timeless atmosphere’. Excess £3m. In 1550, the building, described at the time as ‘a house within a moat’, was bought by Sir Edward Bray of Vachery, whose family were one of the major landowners in the area, with their family seat at nearby Shere. From 1972, when he bought the house from the Brays, until his death last year at the age of 82, Tower Hill Manor was home to Peter Theobald and his family, although Mr Theobald also lived there as a child, from the age of one. 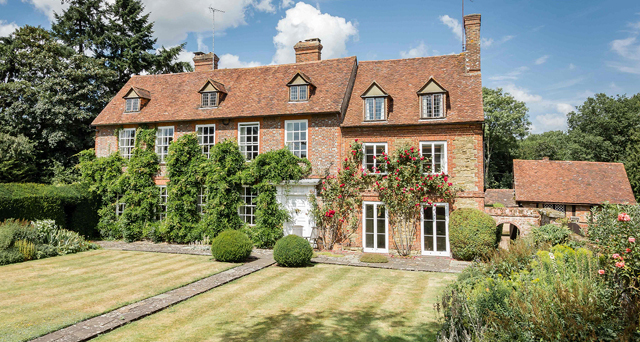 Now, following the recent death of his widow, ‘almost a year to the day later’, the house, set in 41⁄2 acres of gardens and grounds and described by the agents as ‘a spectacular opportunity to revive a Queen Anne gem’, is being sold on behalf of their five children through Strutt & Parker (01483 306565) at a guide price of ‘excess £3 million’. ‘As you might expect after 50 years of occupation by more than one generation of the same family, the manor needs updating and you would have to adapt the layout to make it work for you, but it has some wonderful rooms and it would be a shame to over-egg it,’ comments selling agent Mark Jamieson. a carved-stone fireplace and vintage wall panelling. Their parents’ passing means the end of an era for Mr Theobald’s daughter Jane Batting and her siblings, but they all have the fondest memories of their time at Tower Hill Manor and its uniquely timeless atmosphere. The house has three excellent reception rooms to the front, all with original, untouched features including carved-stone fireplaces, stone ceiling roses, vintage wall panelling and window seats. Upstairs, the proportions and character of the reception rooms are mirrored in the principal bedrooms, especially in the grand, panelled master bedroom, and there is scope to reconfigure the eight bedrooms to create further bathrooms, in addition to the existing three.